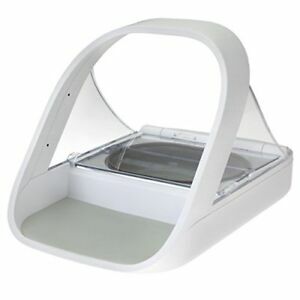 This is a Microchip Pet Feeding Machine from SureFeed. The machine works with the pet's microchip or a SureFlap RFID Collar Tag. When the pet approaches the feeder, the door opens allowing the pet to eat. The machine prevents pets from eating too much and small children from accessing the food. The machine measures 230 x 310 x 215 mm and requires 4 x C batteries. There are 1,099 items available. Please enter a number less than or equal to 1,099. Immediate payment of GBP 87.99 is required.